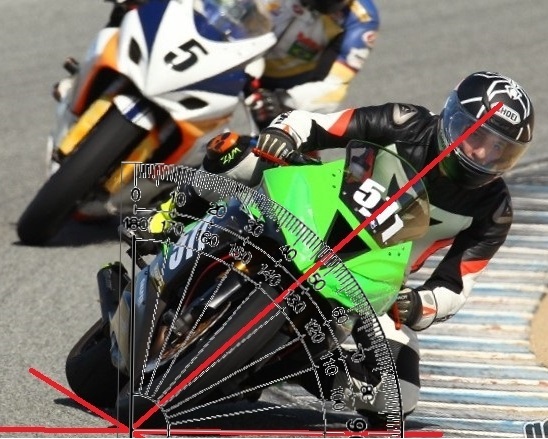 ZX6R Forum > ZX6R Forum > Racing > Whats YOUR Max Lean Angle? 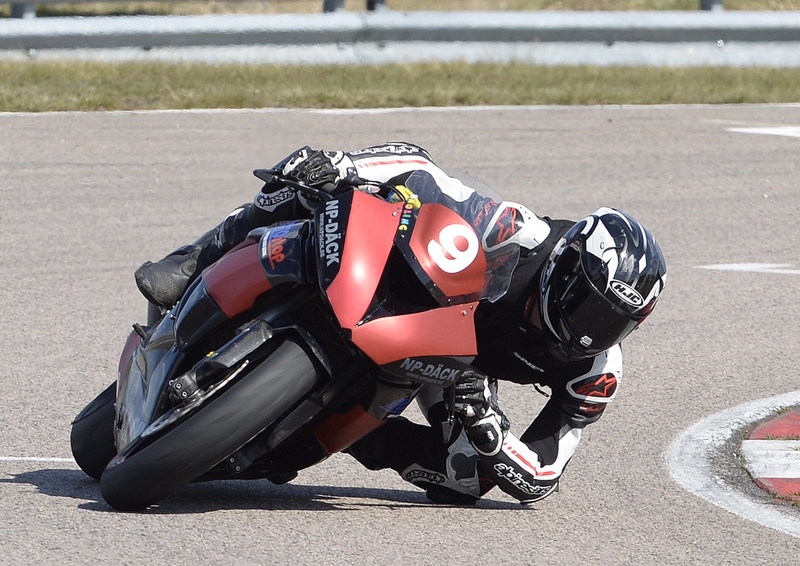 I was in a discussion at work about MotoGP and I was asked the question about my own personal max lean angle achieved. Well, needless to say, this both dumbfounded and intrigued me as to what angles im hitting on a regular track day. (I only track day a few times a year, not racing). So, out of curiousity, I'm wondering what maximum lean angles are on our common street/track tires and what you guys are hitting as well and on what tires... WITHOUT crashing. This is just for a bit of fun and in no way intended to cause a wee-wee sizing contest like my google research has uncovered in other forums. 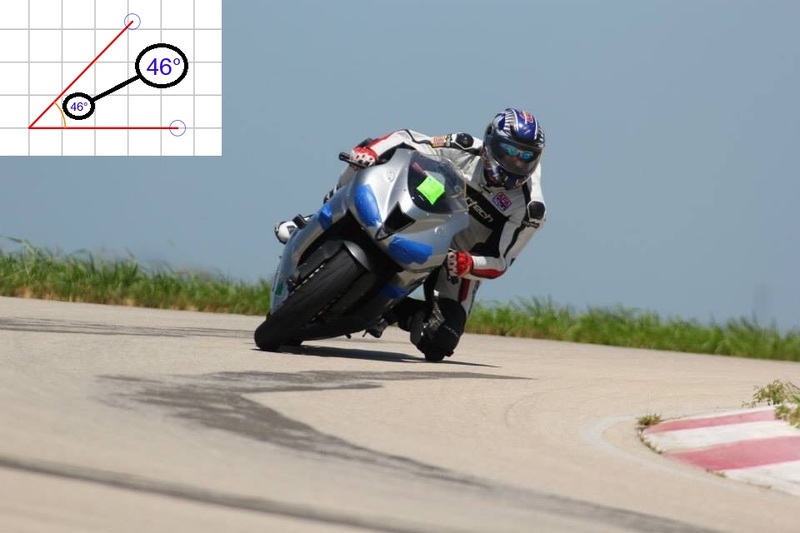 I figured out the attached is a 46 deg angle of attack by the bike on Q3s on my 2007 zx6r. Last edited by Knotty Boy; 07-19-2018 at 10:13 PM. Last edited by Knotty Boy; 07-17-2018 at 10:04 PM. I don't know, never measured it. 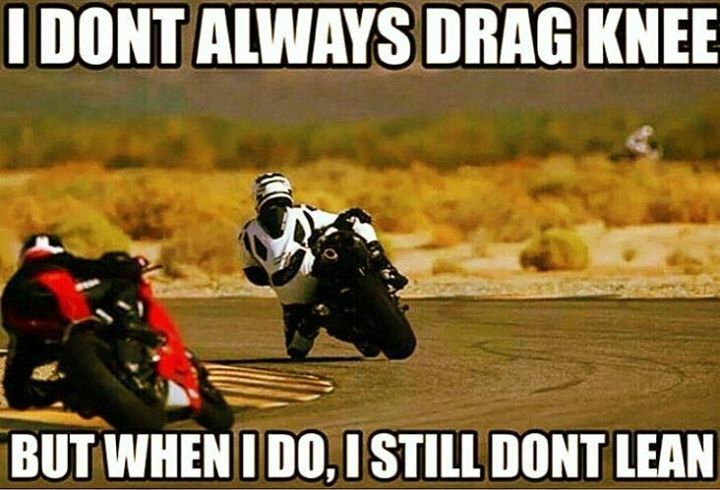 But my guess based on pics and based on following others at the track who did have an inclinometer (yes that's a thing) built into their data loggers on their bikes, while having very similar body position and pace as me...I reckon about 55ish. That's on any tires really and most bikes I've ridden at the track. Lean angle is no different. Those last few degrees is what separates the pros from the rest of us. MotoAmerica, BSB, WSBK pros are usually at about 60-62 degrees. MotoGP guys will hit 64-65 degrees, but they're also on tires and bikes that none of us can really get. Two different one's. In my mind, elbows about to touch. Knotty Boy and Gawernator like this. I've achieved 90° . My bike and I were sliding parallel to the ground . Knotty Boy, Indy, Gawernator and 3 others like this. ... I'm wondering what maximum lean angles are on our common street/track tires and what you guys are hitting as well and on what tires... WITHOUT crashing. Last edited by jd41; 07-18-2018 at 08:07 AM. 2) a dedicated telemetry device. I bought a gadget called a “brain dose” from an Italian company on Kickstarter. Does basically the same thing as Harry’s with a few additions - 20hz instead of 1hz as on an iPhone, and plots your laps against a Google Maps background. Also promised a bunch of extra cool stuff that currently doesn’t work. Although that looks about right, it's not an accurate way of measuring it because the pic is not taken from directly in front of you. If you can see any side of the bike or the tail, it's not a good example for drawing lines on it and measuring like you did. Anyone care to calculate that one? It isn’t max but at least pretty close. PowerGroove, Schooley, Gawernator and 1 others like this. "Its not about being first on the gas, its being first to full gas"
I agree with you but it's just a guess since I couldn't find any pictures shot with me directly in front of the camera. Knotty Boy, kwakamole, sbk1198 and 1 others like this.